Poseidon, Greek god of the sea, was one of the most powerful of all of the gods in Greek mythology. He was one of the 12 Olympian gods and goddesses who held court on Mount Olympus - the mountain of the gods. Poseidon is the son of Cronos and Rhea, and brother to Zeus, Hades, Demeter, Hestia, and Hera. After helping brother Zeus overtake control of the world from their father, Cronos, Poseidon was involved in a high-stakes game of drawing lots. The winner would be awarded control over the heavens, second would get control of the sea, and the smallest lot would have control of the Underworld. Thus, the world was divided into three "territories". Zeus controlled the heavens, Poseidon the sea, and unlucky Hades was forced to live in the Underworld for the rest of his days. All three brothers would be given equal rule over the land, but in many respects nobody exercised this power more than Poseidon. 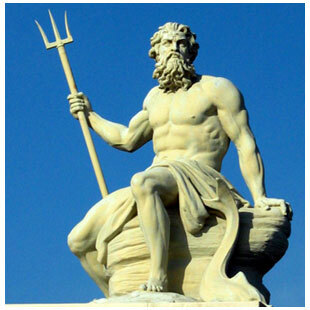 God of the Sea might well have been his title, but many also considered Poseidon Greek god of earthquakes as well, for he shook the earth so vigorously so often that Hades was afraid the walls of the Underworld might collapse under all of the shaking. He was often associated with bulls and horses - creatures that can shake the earth fairly well themselves. Known as Neptune in Roman mythology, he was considered an unruly god who was often prone to temper tantrums and angry bouts of revenge. In this way he was much more like sister Hera that brother Zeus, who often had to resolve Poseidon's conflicts so he wouldn't cause too much destruction. Though he had avoided being relegated to the Underworld, was able to live on Mount Olympus, and was highly recognized and worshiped, Poseidon was often jealous of Zeus's power and authority. At one point he even tried to chain Zeus up, but his plan failed and he was once again put back into his place. Appropriately, Poseidon, Greek god of the sea, was most often depicted riding atop the ocean waves, sometimes on his chariot pulled by seahorses. He was almost always shown holding his signature weapon, the trident, which is often used by humans as a fishing spear. Like Zeus, he was typically shown as a strong-bodied man with a full beard and white hair. His wife was the sea nymph Amphitrite, but (like many of the gods) he sired children with many different women. Interestingly, many of these children ended up being monstrous half-breeds including the famous cyclops Polyphemus, the winged-horse Pegasus, and his merman son Triton.